So far we’ve talked a lot about the technical aspects of SEO and setting up your website for success. We’ve also talked about content marketing and building content that ranks and drives new visitors who can become customers of your product. Now let’s talk about the elephant in the room for SEO, which is link building. We’re going to talk about what link building actually is, how it has changed over the years, and how your startup should think about link acquisition to get those initial links that help you rank. What is link building actually? If you want to rank, you need links into your website from other websites. When Google launched in 1998, what set them apart from the other search engines of the day was that they used links to determine rankings. Links, in their view, counted as votes of popularity and thus how well the site/page should rank. Link building is the act of proactively getting other websites to link back to your site. These count as votes to your site and your content, and thus your website is seen as more valuable and relevant. You shouldn’t focus on what your Domain Authority is as a KPI (more on that in the metrics section), but you should understand that your website can become stronger and be able to rank for a larger quantity of and more competitive terms as you acquire more links to your website from more authoritative websites. If you are trying to outrank your competitors, one place to start is by seeing if their site is stronger than yours. This is just one of many factors, but it’s important. The more and better links you have, the stronger your website and the better you rank. Building links is about improving your website’s strength to rank better. And when you build links, that also means that you can earn referral traffic from supposedly very qualified sources. These are the links that search engines want to reward. Briefly, let’s talk about how links work. Followed links are the links that pass link equity and are guaranteed to help you rank better. If a link is followed and from a strong relevant website, then this is the best link you can get to help your rankings. By default, links are followed on the internet. Search engines since Google have historically relied on them to help rank sites. Nofollowed links are links that are tagged so that they do not pass link equity. There are many reasons that a link should not pass link equity, such as if it’s purchased or not editorially controlled by the site administrators. Google announced in 2005 that they would integrate the nofollow tag, and over the years we have seen an increase in the number of nofollowed links around the web as “link building tactics” like comment spam on blogs became commonplace. Now you can expect that all links from blog post comments sections are nofollowed. Finally, let me be clear that every natural link profile has nofollowed links in it. In fact, a link profile is suspect and more risky to a search penalty if there are not nofollowed links! As we’ve already said, nofollow links are a natural part of the web and links. Over the years, link building has changed a lot. As search engines have matured and the online ecosystem has grown up, strategies and tactics necessarily change. This is no different in SEO and link building. Tactics that worked 10 years ago do not work now, nor should we expect them to work. Unfortunately, a lot of the content about link building online focused for a long time on quick tricks and hacks to get a few links and game the search engines. Fortunately (in my view), a lot of these tactics have stopped working as the search engines have become better at identifying link spam at scale. With a combination of their Penguin algorithms and a direct focus on and public outing of websites who went against their guidelines (two that come to mind are Genius and Thumbtack) as well as publicly taking down services meant to influence search engines (such as Private Blog Networks, which you should know about but not use), the search engines have begun to clean up the web and therefore SEOs and those looking to rank better have been forced to focus on great content that meets user needs, and then to engage in great promotion of that content. Gone are the days of spamming thousands of comments on blog posts, buying mass directory links because they give you the anchor text you care about, and buying links on other sites. And I say, good riddance. We get to do real marketing now. In 2018, startup link building looks very different from 10 years ago where you’d hire someone in their mom’s basement to build you 1,000 links for $100. Now, it focuses on high quality links that are earned, not bought. Let’s talk about those, as those are the links that the search engines want to reward long term. What kinds of links matter for SaaS companies and startups? While reality is that in order to get links (for the most part) you will have to ask for it at some point, approaching link acquisition from the direction of adding outsized value to them and their audience is far superior to trying to trick someone into linking back to you. As a SaaS company, what kind of links should you pursue? This depends slightly based on your niche and your competition, because that determines how competitive the terms are for which you are trying to rank. SEMrush, Moz, and Ahrefs all have their own version of a keyword’s difficulty, so decide on the metric you want and determine from there the authority and number of links you need to rank. The best links are earned through doing things that are worth of being talked about. If you have a marketing team or are a founder with a writing addiction (like myself), then creating content can be an awesome way to establish yourself as an authority in your space which then lends itself to other marketing (and link) opportunities like speaking opportunities if that is your desire. We talked at length about content marketing in the previous chapter, so let’s talk about ways that you can use content to build links. First, leverage yourself as a writer to begin guest posting on websites where your audience hangs out. If you’re focused on small businesses, for example, and run a proposal software company then you have a vast audience to reach. 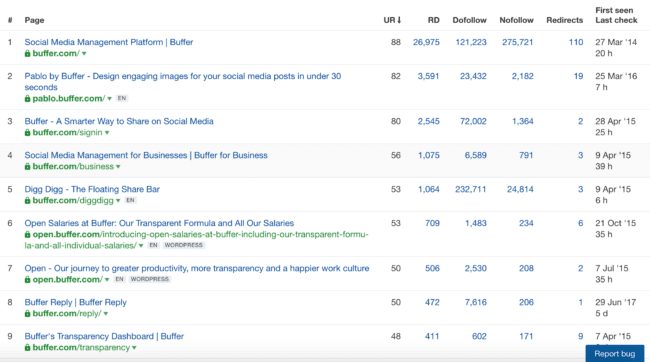 One example of a SaaS startup that used content/guest posting to build their initial audience was Buffer, where cofounder Leo wrote over 150 guest blog posts in under 9 months and acquired over 10,000 users that way. That is a lot of writing and a lot of links that translated into a lot of positive press and customers. You will not be accepted to write guest posts if you haven’t been writing content on your own site previously. Thus this strategy requires upfront work of being a subject-matter expert and proving that you can also write well. If that is not you and you do not have the time to write guests posts, then skip this strategy. One of the most effective ways to build great links and get the attention of an industry is through providing unique data and insights into the industry. While these topics can be difficult to identify, when done well they can shift your industry in your favor. There are a few ways to do this, including conducting surveys and releasing the results and outreaching to publications and influencers who may be surprised by them. This is a fantastic way to build relationships and can also open up other opportunities for collaboration in the future. When I ran marketing at HotPads.com, an apartment and house rentals website, we used this to great effect as have larger companies like Zillow. By investing in data-driven studies that showed unique data, we were able to get links from Today.com, the Washington Post, Yahoo.com, and every single relevant website in our space. Big data pieces coupled with PR-based outreach works. Next, if you’re in the early stages of your company then one of the best ways to get coverage is to have your founder as the public face. If your founder is willing to do it, then avenues like podcast appearances and stories of why you’re doing what you’re doing are PR gold. Podcasts are one of my favorite ways to scale good press and attention. Compared to a blog post that can take many hours of time to create a piece of content that you are proud of and that deserves to earn links, a podcast appearance can be done in under an hour and still rank well for the terms you are targeting if the host also provides a full transcript. Podcasts are a win. The PR strategies here vary. Some startups will hire a PR professional to help them scale outreach (and therefore placements and links). This can work quite well especially if they have good contacts or are able to find the right contacts to get in front of. They can be worth their weight in gold to help you put together your strategy and understand where you should have placements and coverage in order to drive your business forward. Sometimes though, having a PR person doing outreach on your behalf can seem strange to the press. VCs may like that you are extremely busy and don’t have time to do outreach, but press may wonder why you are not doing the outreach yourself. I have found that a combination usually works best. If you are genuinely doing something noteworthy, then introductions from well connected mutual friends are usually the best way to get great coverage on podcasts and in major publications when others are writing. Becoming known as a source is the best way to get these links, and getting personal introductions to the people with writing access is hands down the best way to build these relationships. If you are working with a PR agency or considering it, I recommend that you get their help with the strategy and writing the specific emails and asks. But then have them, if they agree to it, do the outreach as you so that you can also reply directly and be involved in the process. Speak with your PR person about this, as there are likely times when they should own the relationship and other times when you should. Overall, as PR relates to links, your PR person should understand that you’re both looking for coverage (which can be leveraged into other coverage as well) and ideally to get links. While the links from most publications now are nofollowed (meaning they pass no link equity), they can send sizeable referral traffic and my SEO intuition tells me that search engines may value those differently that nofollowed comment links or similar. Finally, partnerships with companies with customers who need what you offer as well as what they offer can be a great way to build links. For example, Credo helps businesses find the right marketing agency to work with. If they need marketing help and are used to work with agencies, then they likely also use web development and design agencies or products. Therefore, I have reached out to and build partnerships with complementary companies so that we can refer work to each other. These links stay around for as long as you have the partnership and can also send you very qualified traffic and customers. These are gold for your business overall and for your SEO rankings! Link building lives and dies by consistent outreach. When thinking about content marketing for SEO, the “marketing” side of that equation is promotion, which is how you get the links that matter and help you rank. Link building succeeds when you consistently look to provide value to the internet. Whether this is big pieces of content that are novel and get new attention or being a source for writers who need a quote, link building requires consistent attention from someone. Within a SaaS company with good MRR, this is usually the content manager or an SEO manager or agency. The person responsible for content/organic traffic should also be the one owning these strategies and efforts, with full support from the executive suite that understands the value and long term thinking required.